Rep. Mia Love is holding a news conference after conceding to Ben McAdams in the race for Utah's 4th Congressional District. Just-defeated GOP Rep. Mia Love fired farewell shots Monday at Republicans, Democrats, President Donald Trump and the news media — with a special volley aimed at the man who beat her, Democratic Rep.-elect Ben McAdams. She also used the unusual news conference to turn her fire on Trump, who mocked her after the election, blaming her defeat on her decision to keep him at arm’s length in the election. Leah Hogsten | The Salt Lake Tribune Mia Love, the former two-term republican representative from Utah's 4th Congressional District held a press conference at the Utah Republican Party headquarters, Nov. 26, 2018 to discuss her accomplishments, Washington politics, President Donald Trump and her future. Leah Hogsten | The Salt Lake Tribune Mia Love, the former two-term republican representative from Utah's 4th Congressional District held a press conference at the Utah Republican Party headquarters, Nov. 26, 2018 to discuss her accomplishments, Washington politics, President Donald Trump and her future. Love was joined at the lecturn with her parents Mary Bourdeau and Jean Maxine Bourdeau, husband Jason, daughter Alessa and son Peyton. 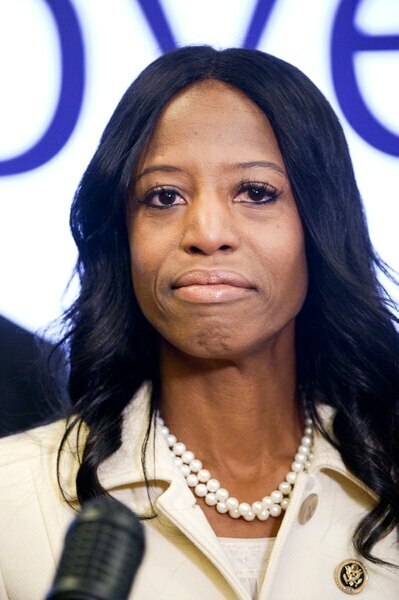 Leah Hogsten | The Salt Lake Tribune l-r When asked if she plan to run again, Mia Love said, ÒI donÕt know. WeÕll see.Ó Love is joined at the lecturn with her husand Jason Love, daughter Alessa and son Peyton. 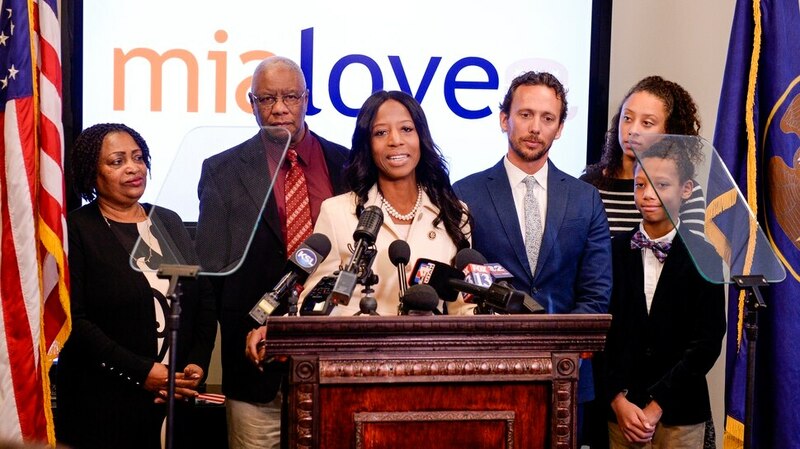 Mia Love, the former two-term republican representative from Utah's 4th Congressional District held a press conference at the Utah Republican Party headquarters, Nov. 26, 2018 to discuss her accomplishments, Washington politics, President Donald Trump and her future. Leah Hogsten | The Salt Lake Tribune l-r When asked if she plan to run again, Mia Love said, ÒI donÕt know. WeÕll see.Ó Love is joined at the lecturn with her husand Jason Love, daughter Alessa and son Peyton. Love, the former two-term republican representative from Utah's 4th Congressional District held a press conference at the Utah Republican Party headquarters, Nov. 26, 2018 to discuss her accomplishments, Washington politics, President Donald Trump and her future. Leah Hogsten | The Salt Lake Tribune Mia Love, the former two-term republican representative from Utah's 4th Congressional District held a press conference at the Utah Republican Party headquarters, Nov. 26, 2018 to discuss her accomplishments, Washington politics, President Donald Trump and her future. 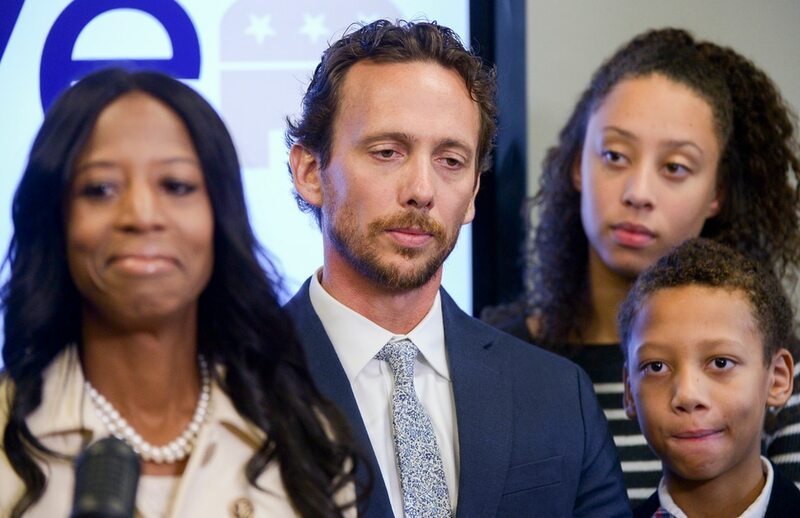 Leah Hogsten | The Salt Lake Tribune Mia Love, the former two-term republican representative from Utah's 4th Congressional District takes off her 114th Congress pin for the years she served (2015-2016) during a press conference at the Utah Republican Party headquarters, Nov. 26, 2018. Love said her defeat means she is Òunleashed, untethered and I am unshackled and I can say exactly what is on my mind.Ó Leah Hogsten | The Salt Lake Tribune Mia Love, the former two-term republican representative from Utah's 4th Congressional District smiles at her family after taking off her 114th Congress pin for the years she served (2015-2016) during a press conference at the Utah Republican Party headquarters, Nov. 26, 2018. Love said her defeat means she is Òunleashed, untethered and I am unshackled and I can say exactly what is on my mind.Ó Leah Hogsten | The Salt Lake Tribune Mia Love, the former two-term republican representative from Utah's 4th Congressional District wears her 114th Congress pin for the years she served (2015-2016) during a press conference at the Utah Republican Party headquarters, Nov. 26, 2018. Love said her defeat means she is Òunleashed, untethered and I am unshackled and I can say exactly what is on my mind.Ó Leah Hogsten | The Salt Lake Tribune Mia Love, the former two-term republican representative from Utah's 4th Congressional District held a press conference at the Utah Republican Party headquarters, Nov. 26, 2018 to discuss her accomplishments, Washington politics, President Donald Trump and her future. Love was joined at the lecturn with her parents Mary Bourdeau and Jean Maxine Bourdeau, husband Jason, daughter Alessa and son Peyton. Leah Hogsten | The Salt Lake Tribune Mia Love, the former two-term republican representative from Utah's 4th Congressional District held a press conference at the Utah Republican Party headquarters, Nov. 26, 2018 to discuss her accomplishments, Washington politics, President Donald Trump and her future. Love was joined at the lecturn with her parents Mary Bourdeau and Jean Maxine Bourdeau, husband Jason, daughter Alessa and son Peyton. Leah Hogsten | The Salt Lake Tribune Mia Love, the former two-term republican representative from Utah's 4th Congressional District held a press conference at the Utah Republican Party headquarters, Nov. 26, 2018 to discuss her accomplishments, Washington politics, President Donald Trump and her future. Love was joined at the lecturn with her parents Mary Bourdeau and Jean Maxine Bourdeau, husband Jason, daughter Alessa and son Peyton. Leah Hogsten | The Salt Lake Tribune Mia Love, the former two-term republican representative from Utah's 4th Congressional District held a press conference at the Utah Republican Party headquarters, Nov. 26, 2018 to discuss her accomplishments, Washington politics, President Donald Trump and her future. Leah Hogsten | The Salt Lake Tribune Mia Love said her defeat means she is Òunleashed, untethered and I am unshackled and I can say exactly what is on my mind.Ó Love, the former two-term republican representative from Utah's 4th Congressional District held a press conference at the Utah Republican Party headquarters, Nov. 26, 2018 to discuss her accomplishments, Washington politics, President Donald Trump and her future. Leah Hogsten | The Salt Lake Tribune Mia Love, the former two-term republican representative from Utah's 4th Congressional District held a press conference at the Utah Republican Party headquarters, Nov. 26, 2018 to discuss her accomplishments, Washington politics, President Donald Trump and her future. Her news conference at Utah Republican Party headquarters in Salt Lake City — standing beside her parents, her husband and two of her children — was the first time that Love talked directly to the news media since final vote counts last week showed that she lost the race by 694 votes. Chris Karpowitz, co-director of the Center for the Study of Elections and Democracy at Brigham Young University, said Love’s news conference and its “equal opportunity bashing” were definitely a departure from politics as usual. If she were planning to run again for her House seat, “The traditional thing to do would simply be to congratulate your opponent and wait for another day," he said. " …. It definitely was not a speech that included olive branches to anyone." While her criticisms were wide ranging over many targets, McAdams, the two-term mayor of Salt Lake County, took her harshest shots over his attack ads. However, Love actually ran the first negative attacks in the campaign and kept up a steady stream of them — as did McAdams. McAdams chose not to fire back. His campaign manager, Andrew Roberts, released a statement simply thanking Love for her call to McAdams over the weekend congratulating him on his win. Love, the first and only black Republican woman elected to the House, lashed out at both parties Monday — saying Democratic policies hurt blacks, that Republicans make minorities feel unwelcome, as shown by some actions by Trump. She said she was surprised that while votes were still being counted, Trump took his jab at her. While conservative policies could help blacks, she said, “because Republicans never take minority communities into their homes … and into their hearts, they stay with Democrats and bureaucrats in Washington because they do take them home, or at least make them feel like they have a home." She also took a shot at the news media. Love said that, sadly, Utahns should expect “that this is how elections will be won” from here on out. Why could she not have done that the past four years as a member of Congress? “There are a lot of people as a representative that you are representing, and you want to make sure that you are incredibly careful in some of your responses and some of your thoughts. I think that’s the difference,” she said. Did she make a mistake by not speaking out more before now? “I do not have any regrets for my actions and behaviors as a representative,” she said. Karpowitz, the BYU political scientist, said Love’s performance might hurt her if she chooses to run again for a House seat but could help her move toward other roles — such as becoming a GOP spokeswoman to and about minorities. “Clearly, she’s felt frustrated within the Republican Party. That’s what made the press conference so unusual. She was simultaneously arguing for Republican policy positions and against the party’s current approach to bringing in people of color,” he said.